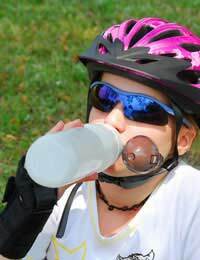 Active kids need to drink plenty of fluids to stay properly hydrated preferably water. It’s a good practice to drink before, during, and after a workout to prevent the health problems that dehydration can cause. When kids lose more fluids than they take in, they can quickly become dehydrated. There are a number of causes and dehydration is quite common amongst babies, kids, and teens who have been sick with a gastrointestinal illness. Vomiting and diarrhea deplete the body of fluids rather rapidly and when kids don’t feel well, they are inclined to refuse liquids. Another cause of dehydration is failing to hydrate properly when playing sports. Although this isn’t all that common, it can happen, especially during hot weather or extended or especially ambitious workouts. Our bodies are comprised of mostly water; slight dehydration may not cause obvious symptoms, but extreme dehydration can cause serious problems. Participants in certain sports with strict weight guidelines such as wrestling sometimes dehydrate themselves on purpose in order to drop weight quickly. This is a dangerous practice and parents of kids and teens involved in sports should be sure to stress the importance of staying well hydrated and well fed, not only for sound health but to enhance athletic performance, as well. Even low level dehydration diminishes strength and endurance, so while athletes may think they are improving their position by limiting fluids in order to fool the scale, in reality they are putting themselves at a distinct competitive disadvantage. Additionally, some student athletes as well as kids who are trying to control their weight for aesthetic reasons sometimes utilise laxatives or diuretics, both of which can cause dehydration. Older kids and teens have been known to use these products because they mistake the temporary water loss that these products cause with real weight loss, unaware of the risks that they are taking with their health. Continued use of laxatives, diuretics, or extreme dieting can alter the levels of sodium and potassium in the body and can even lead to heart rhythm problems. Parents need to help their kids focus on sound health and fitness, rather than prioritising a certain body type – thin is not necessarily healthy. At the first sign of dehydration, children should rest (in the shade or another cool place) and drink plenty of plain water to replenish their fluid levels. Some kids favour sports drinks to water, which is fine as long as they chose their beverages carefully. Traditional sports drinks are usually considered safe, but some of the newer ones on the market contain herbs or caffeine that can be harmful and even further dehydration. Caffeine acts as a diuretic, which increases urine output, defeating the purpose of drinking for hydration. Taking in sufficient fluids is important, especially in hot weather or upon exertion, but a number of factors can help determine the necessary quantity of beverages needed. Water-rich fruits and vegetables can help kids to maintain healthy hydration levels, so snacking on grapes, citrus fruits, watermelon, zucchini, and tomatoes is a smart way to stay hydrated while meeting kids' need for "5 a Day." Dressing appropriately for the temperature and activity level matters, too. When playing outdoors on sunny days, hats can help kids to keep cool and wearing loose fitting clothing can be beneficial as well. Parents and coaches should encourage kids to drink before beginning a workout and then allow time for a water break at least every 20 minutes or so after that. Finally, scheduling strenuous activity for early mornings or evenings, rather than mid-day is wise, especially on hot, dry days. While most cases of dehydration are easily remedied by taking in additional fluids, there are exceptions. Extreme dehydration, especially when part of an illness that causes vomiting and/or diarrhea may require intravenous (IV) treatment at the hospital to return fluid levels to a healthy range. Although bouts of dehydration are typically short-lived, frequent thirst and dehydration may be indicative of diabetes or other illness, so parents should seek medical advice if they notice their children exhibiting symptoms of dehydration without obvious cause.